Soy is a pretty popular “health food” that’s commonly used as an alterative to animal products. It’s a great source of protein, and is produced by extracting various parts of the soybean. Soy health benefits are rather wide-ranging, and its different forms—from powder to milk to fiber—are used in a variety of ways. Soy is often consumed as powder, which is generally used as a protein supplement; soymilk, which is used as an alternative to dairy; or soy fiber. The active ingredients in soy are isoflavones. When they are ingested, they are changed to phytoestrogens, which are similar to the naturally-produced hormone estrogen. Soybeans are legumes and related to a variety of other beans in your diet, but they are unique in the sense that they’re a plant-based complete protein. This means they feature all the essential amino acids required to make up a full protein. Aside from being a great source of protein and an animal-based food alternative, soy is a rich source of a number of vitamins and minerals. Here is the nutritional information for one cup (180 grams) worth of green, cooked, and boiled soybeans. We listed them briefly earlier, but let’s take a closer look at some of the potential health benefits of soy. A 2018 meta-analysis published in the journal Nutrients found that soy consumption is associated with a reduced risk of prostate cancer. The findings indicated that isoflavones, once introduced to cells, were able to act as weak estrogen receptor agonists or antagonists, depending on the cell type and its current estrogen concentration. This helps lower prostate cancer risk by reducing PSA (prostate-specific antigen) levels, and preventing cancerous cell proliferation. Previous studies, dating back to 2004, have also shown soy intake can improve PSA levels. Results have shown that men who added about two ounces of soy grits per day to their diets had quick and noticeable drops in PSA levels. Over a one-month period, the men, who all had prostate cancer, saw total PSA drop by 13% and free-to-total PSA ratio increase by 27%. An increase in the free-to-total ratio is a good thing in regard to PSA risk. When it comes to soy’s influence on prostate cancer risk, the benefits seem to be associated with unfermented soy foods like tofu, edamame, and soy milk. Fermented soy foods were not observed to influence prostate cancer risk; however, researchers concluded that more studies need to be performed to fully understand if the fermented soy products influence prostate cancer. Fermented soy products include tempeh, natto and miso. Because prostate cancer is the second most commonly diagnosed cancer in men, finding modifiable lifestyle factors like diet is important. Perhaps including soy in your diet can help reduce the risk of, or manage, prostate cancer. High blood pressure is a chronic health condition facing millions of Americans, and consuming soy may help bring blood pressure down. High blood pressure, or hypertension, is a risk factor for heart disease and can play a big role in early mortality. Studies have shown that compounds in soy—namely isoflavones—have the ability to reduce high blood pressure by acting as a vasodilator (relaxing veins and arteries) and by inhibiting an enzyme involved in blood pressure regulation. Isoflavones have been shown to increase the body’s levels of nitric oxide (NO) to help relax and expand arterial flow, so blood moves through more easily. Results in this area, though, have been mixed and seem to have individual variance. It’s possible that the efficacy of soy as a vasodilator is dependent on an individual’s ability to metabolize daidzein, which is a specific type of isoflavone. The fiber in soy can also play a role in reducing blood pressure for better heart health. 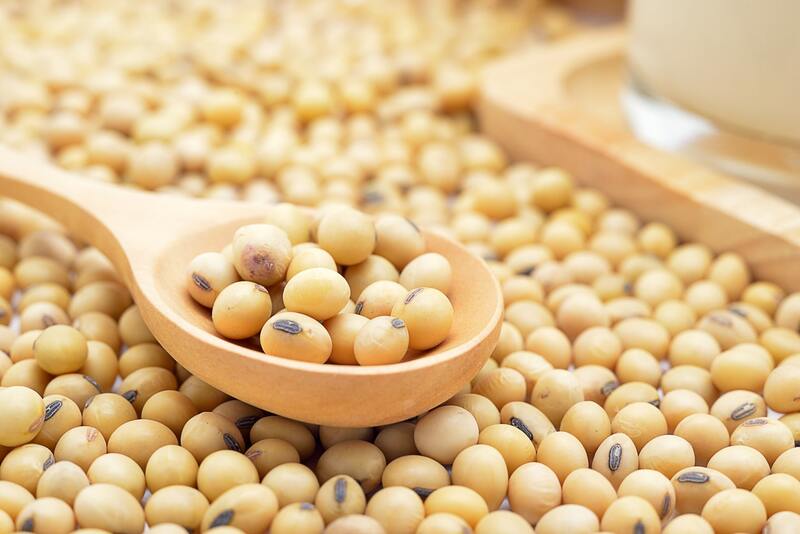 Soy proteins, as well as other soy products, have been found to promote heart health by boosting NO and acting as a good source of dietary fiber. It should be noted that the blood-pressure lowering effects of soy have been noted in people with existing hypertension, and it’s unclear how or if they would influence people in the “healthy” blood pressure range. When it comes to using soy to keep cholesterol in check, it may have a small effect. That said, consuming soy products should not be your primary tool if your goal is to reduce the amount of “bad” LDL cholesterol in your bloodstream. Studies have shown that soy protein supplements can make slight reductions in LDL; however, the amount you have to consume is rather high. You’d need to consume about 50 grams of soy protein per day to reduce LDL by roughly three percent. The cost and commitment to consumption might not be worth your time. Still, if you’re substituting more soy-based snacks for sugar-laden ones, it could have an indirect influence on LDL. Furthermore, soy can be a good source of fiber, which can also help reduce LDL. Studies have shown that eating soy can lower one’s diabetes risk by improving insulin sensitivity. A 2009 study conducted by researchers at the University of Massachusetts in Amherst found that the soy isoflavones daidzein and equol seem to work similarly to current anti-diabetes drugs by targeting fat cells to mobilize proteins that enhance glucose (blood sugar) metabolism and insulin sensitivity. Although they used mouse cells to reach their results, they believe the findings would be replicated in humans. A 2004 study analyzing human urine also provided evidence that soy has the potential to decrease diabetes risk. One of the ways diabetes expresses itself is through the presence of small amounts of proteins in urine. To test the effects of soy on diabetes, researchers took a small sample group of 14 men aged 53-73 with type 2 diabetes, each of whom had been diagnosed with diabetes-related kidney disease. Men who received a soy protein drink showed a 10% reduction in the amount of protein in their urine, indicating that soy may have a worthwhile role in managing diabetes. There is research indicating that isoflavones present in soy may also help strengthen the bones of post-menopausal women, indicating the legume could be part of an osteoporosis defense plan. Regardless of the source, it seems that soy may protect women from osteoporosis. Soy-rich foods, including lentils, kidney beans, lima beans, fava beans and chickpeas, feature isoflavones that, as mentioned, have a similar structure and function to estrogen. It’s possible that this is where the benefits for osteoporosis exist. Because post-menopausal women have drop-offs in estrogen production that can increase the risk for osteoporosis, soy may help reduce the effects. A 2015 study showed that women who took 30 grams of soy protein and 66 mg of isoflavones per day for six months presented fewer markers of bone loss. Therefore, soy may play an instrumental role in protecting bones with age. When it comes to soy and breast cancer, there is a little bit of controversy. This has to do with the fact that estrogen plays a major role in the development and proliferation of breast cancer cells. Soy and isoflavones, as we’ve discussed, are very close in structure and function to estrogen and stimulate receptors very similarly. For that reason, it can be easy to assume that soy can have a dangerous effect on breast cancer. Some research, however, indicates that soy and isoflavones may actually reduce the likelihood of breast cancer development and recurrence. In this situation, it appears the compounds in soy may compete with estrogen to bind to receptors, thereby reducing the actual amount or estrogen allowed into the cell. This anti-estrogenic effect may be why low-moderate soy consumption seems to have benefits for cancer breast cancer risk and recurrence. In fact, a 2009 study published in JAMA found that moderate soy intake could have greater, or at least similar, effects than tamoxifen, a commonly used breast cancer prevention and treatment drug. The effects of soy on breast cancer are unclear, so it’s highly recommended that you talk to your oncologist about its safety in your particular case. No matter how you want to look at it, soy is a pretty controversial food. There are proponents and detractors on each side, both with very valid arguments about where soy stands as a food option and as a preventative/treatment tool. Soy can offer some health benefits when taken in moderation, but it’s not necessary to include it in your diet if it isn’t already present. Adding a moderate amount of soy to a healthy and balanced diet may be a way to prevent or manage certain conditions, but going overboard can also present some dangers. If you’re thinking about making a big increase in how much soy you eat, talk to your physician first. Applegate, C. et al, “Soy Consumption and the Risk of Prostate Cancer: An Updated Systematic Review and Meta-Analysis” Nutrients, Jan. 2018, DOI: 10.3390/nu10010040; https://www.ncbi.nlm.nih.gov/pmc/articles/PMC5793268/, last accessed September 28, 2018. Ramdath, D., et al, Beyond the Cholesterol-Lowering Effect of Soy Protein: A Review of the Effects of Dietary Soy and Its Constituents on Risk Factors for Cardiovascular Disease,” Nutrients, March 24, 2017, DOI: 10.3390/nu9040324; https://www.ncbi.nlm.nih.gov/pmc/articles/PMC5409663/, last accessed September 28, 2018. Teixeira, S. Journal of Nutrition, August 2004; vol 134: pp 1874-1880. News release, University of Illinois at Urbana-Champaign. Shu, X. et al, “Soy Food Intake and Breast Cancer Survival” JAMA, December 9, 2009, DOI: 10.1001/jama.2009.1783; https://www.ncbi.nlm.nih.gov/pmc/articles/PMC2874068/, last accessed September 28, 2018.